Use detergent with dry ice bubbling in water, to produce bubbles filled with carbon dioxide gas. Push one end of the tubing through the base of the polystyrene cup. If a funnel is available attach to the other end of the tubing, using tape if necessary to seal any gaps. Add warm water and a (gloved) handful of dry ice pellet to the bottle, to start the bubbling. Place the funnel over the bottle, so that dry ice is pushed along the tubing. Once dry ice gas is coming out of the tubing at the end with the styrofoam cup, dip the rim of the cup into the container of detergent. A large bubble should form with swirling dry ice inside. 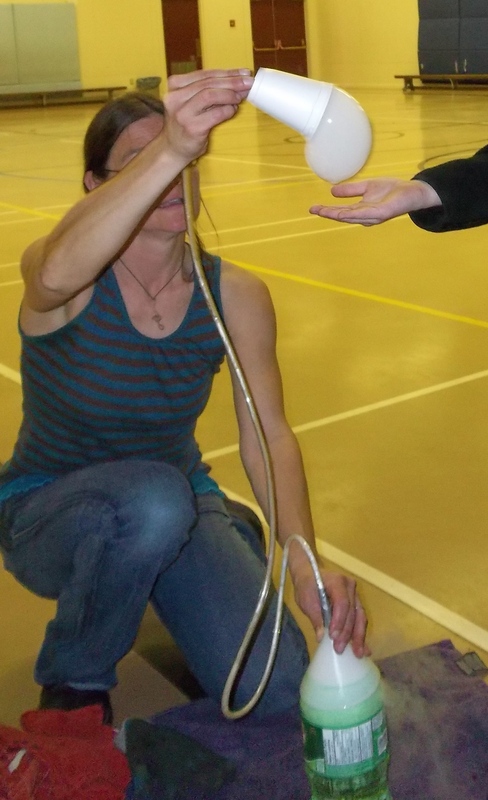 The dry ice bubbles will fall quite rapidly, as carbon dioxide is heavier than air. They are fun to have pop on your hand, when the dry ice cloud flows out of them.